1. Student approaches teacher with the news of this exciting new opportunity. 2. 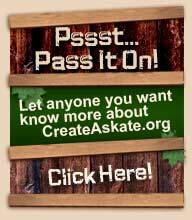 Teacher responds positively; visits CreateAskate.org for more specific information; approaches administration with exciting new opportunity. 3. Administrators register with CreateAskate.org. 4. Students independently raise the $15 participant fee through fundraising activities there they work as a team with their classmates. 5. Students watch CreateAskate video and Stuntwood video in class. They then document their height and take their first test based upon the content of the two videos. 6. Teachers order necessary materials from CreateAskate.org. 7. School receives materials from CreateAskate.org. 8. Teachers conduct class with CreateAskate.org curriculum; students successfully create their own personal skateboard; CreateAskate.org Certificates of Completion are awarded. 9. Teachers beam with pride knowing their students have learned so much more than just how to make a skateboard deck. 10. Students beam with pride knowing they’re capable of making something with their own hands, which is so much more than just making a skateboard deck. 11. Administrators and parents are happy to see students engaged and involved in school activities. So, if you’re a student you’ll need the support of a classroom teacher and more than likely your school’s administration, too. 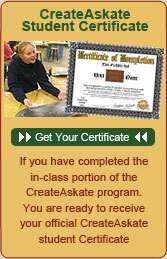 Although the CreateAskate.org program is designed specifically for woodshop classes, another version of the CreateAskate.org program can be presented to art class or design class students. 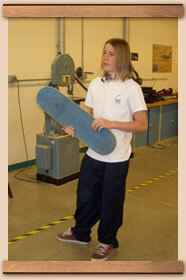 Thus, an individual student could approach their shop teacher, or their art class teacher, and refer them to the CreateAskate.org website for the necessary information. Of course, this approach will most likely succeed if presented in a respectful and informative manner. It’s also easy to imagine some teachers not being initially thrilled by the prospect of an entire class making their own skateboard, right? Diplomacy has to be one aspect of the enthusiasm a student might bring to a teacher. A student’s respectful enthusiasm just may be enough to tweak the interest of a teacher who might otherwise dismiss the concept of making a skateboard as being worthwhile. Likewise, a teacher’s respectful approach to a school administrator, or the administrator’s approach to the district all have to share the same informed enthusiasmCreateAskate.org programs can help create a positive learning experience for everyone involved in the experience. If you’re a student your situation may vary slightly from the above scenario, but CreateAskate.org programs are now available, so your first step may be to discuss this information with your parents, with your school’s PTA or organizers that can help you guide CreateAskate.org programs into your particular learning environment.